The next video game from the ’80s is coming to the big screen this April and Dwayne “The Rock” Johnson is going up against giant apes in the adventure. In the film, Johnson plays primatologist Davis Okoye who shares a bond much like Chris Pratt with the raptors in Jurassic World. This time, it is with George, an extraordinary gorilla who he has raised since birth, but through a genetic experiment something happens that turns the gentle ape into raging monster. Now, it is up to Okoye to find an antidote in order to save the world and the ape. The film also stars Moonlight‘s Noamie Harris as Dr. Kate Caldwell, as well as Grey’s Anatomy‘s Jeffrey Dean Morgan as Agent Russell and Watchmen‘s Malin Akerman as Claire Wyden. 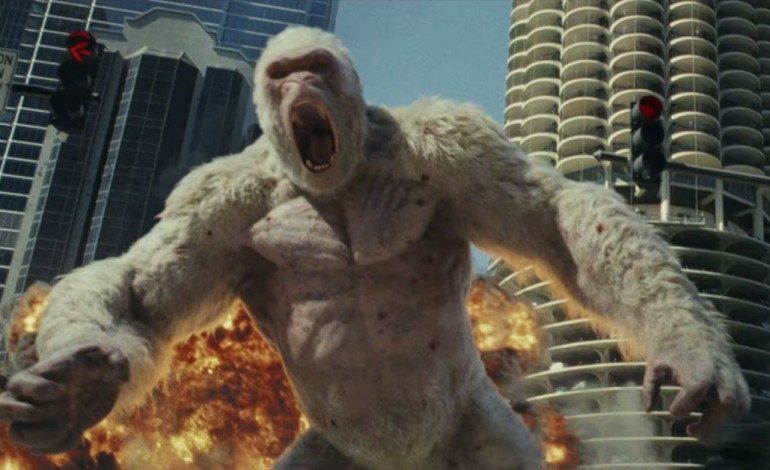 Rampage is directed by Brad Peyton, who has much experience with Johnson after working alongside him in both San Andreas as well as Journey 2 The Mysterious Island. The action adventure is set to open in theaters April 20, 2018.